Teflon® coatings have developed a special place in the industrial coatings market and as a result Chemours™ has created a leading brand. To promote the brand name of Teflon® and to reflect the identity and integrity of the product range, Chemours™ has developed a network of licensed applicators throughout the world. The Teflon® brand provides assurances that the product it identifies, are of the highest quality and contain only genuine Chemours™ fluoropolymers. PTFE Applied Coatings is one of the Licensed Industrial Applicators (LIA) that has been selected by Chemours™, such a selection confirms the extensive knowledge and experience held by PTFE Applied Coatings in the application of Teflon® industrial coatings, as well as for the quality of its workmanship. As one of the selected applicators, we maintain a stock of a broad range of Teflon® coatings, and are able to assist customers to evaluate and select the coating system to meet any most requirements. PTFE Applied Coatings are also kept abreast of new coating technologies from Chemours™ and have the contacts within Chemours™ to maximise the resources and support offered to customers. Having the endorsement by Chemours™ permits PTFE Applied Coatings to offer the world’s leading product to industries that include automotive, pharmaceutical, oil and gas, as well as the chemical process industry. As a LIA, we are able to provide customers the assurance and knowledge that an optimum product and service linked with materials of the highest standard will be afforded. 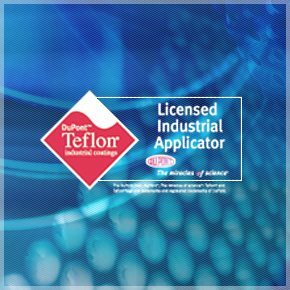 Industrial applicators offering Teflon® coating services, who meet Chemours criteria, are entitled to identify themselves through the use of the emblem of LIA. The Chemours™ Teflon® trademark is owned exclusively by Chemours™ and may only be used under license from Chemours™.